We’d love your help. Let us know what’s wrong with this preview of Division of the Marked by March McCarron. Every year, 50 children are marked. They join a superhuman society of scholars and martial artists. But this year, only 49 are found. As time passes, more and more children disappear. Yarrow and Bray meet upon their marking and feel uniquely connected. However, a decade long separation renders them rivals. Can they overcome their differences to unravel the mystery that thr Every year, 50 children are marked. They join a superhuman society of scholars and martial artists. But this year, only 49 are found. As time passes, more and more children disappear. Yarrow and Bray meet upon their marking and feel uniquely connected. However, a decade long separation renders them rivals. Can they overcome their differences to unravel the mystery that threatens their kind? To ask other readers questions about Division of the Marked, please sign up. The characters are amazing,the story is soo interesting and that ending!Also,(view spoiler)[MY BABY ADEARRE DIED AND PEER TELLING HIM THAT HE LOVES HIM I CANNOT ASDFGHJKL (hide spoiler)] broke my freaking heart.I really love how Bray develops as a character and how there are a lot of interesting twist. Overall,fantastic book that I would recommend to Fantasy,YA SWEET.BABY.JESUS. Overall,fantastic book that I would recommend to Fantasy,YA and Adult lovers. "I've not spent much time with arrogant little prats.I don't know what sorts of things your kind talk about." “Where's my hug?” Arlow asked, fists on hips. Bray laughed. "What did you do?" "I..." he gestured into the air,as if summoning some once-know piece of information, and coming up empty. "What shall we do now?" he asked. This was one of the best free Amazon downloads I've read in a while, and actually just one of the best books I've read in a while. It was enjoyable, the editing was excellent unlike many free downloads (no misspelled words, no strange spacing...), good pacing, decent world building and character development. The big mystery wasn't really too shocking, and somewhat predictable, but not in a bad way. So, the plot was good. I couldn't have asked for anything more. Can't wait to read the next book! FREE on Amazon today (10/19/2017)! Division of the Marked is one of the best books I have read this year. The world that March McCarron has created seems very real for a fantasy world. The characters are fully formed and are people you can really care about. The pacing is perfect and you want to just keep reading without stopping to eat or sleep. This series is wonderful and I can hardly wait for the sequel(s). I was so surprised by this book. When it starts the characters are 14 years old. You are on this journey with them. Then you jump 10 years later. It's nice to see how they turned out. I loved the story, the characters (even Bray grew on me). I loved the world that was created. It even made me tear up! I love a story that makes me feel! Ughh sooooo good! I will continue with the series! Let me tell you why it took me nearly 3 weeks to finish this book. I savored it. Truly savored it. I saved the last 30% of the book because I DIDN'T WANT IT TO END! I dolled it out a few pages at a time, pausing, letting it sink in, even shedding a few tears. Now, a few hours later, I'm still thinking about the ending. Division of the Marked tells the tale of a group of very special children. Fifty children are marked each year to join two elite groups. The Chisanta do many Wow. Division of the Marked tells the tale of a group of very special children. Fifty children are marked each year to join two elite groups. The Chisanta do many things. They protect. They learn. They guard. They study. Each has their own gift. There are two groups of Chisanta and they have been taught to hate each other. Can you guess where this is going? As children, Bray and Yarrow have a bit of a first romance. But then they are separated - members of these two groups who have an intense dislike of each other. But years later, they are thrust back together to solve a very disturbing mystery. Someone is killing marked children. Or are they? You'll have to buy the book to learn more. And oh should you ever buy this book. The characters are so rich and dynamic. I could FEEL what each was thinking. The description of the environment, the world, the action is all top notch. But what really got me...what stuck a knife in my gut and twisted was the relationship between Bray and Yarrow. This isn't a romance novel. It's action/fantasy. But the love story is so beautiful. It's very understated, which makes it even stronger. I will warn you. The book does not end with everything wrapped in a tiny red bow. I closed the book with an anguished scream. I want to know what happens NOW! I cannot wait to read the next one. I haven`t enjoyed a novel like this since my last brush with a Brent Weeks and William Nicholson novel. What I enjoyed the most was how effortless the story read. Each chapter flowed into the other creating that undeniable urge to turn the page to find out what was going to happen next to this group of friends, but most importantly Yarrow and Bray. After I reached chapter five, I said to a friend of mine that there was nothing contrived about the story. Obviously the story was thought out quite I haven`t enjoyed a novel like this since my last brush with a Brent Weeks and William Nicholson novel. What I enjoyed the most was how effortless the story read. Each chapter flowed into the other creating that undeniable urge to turn the page to find out what was going to happen next to this group of friends, but most importantly Yarrow and Bray. After I reached chapter five, I said to a friend of mine that there was nothing contrived about the story. Obviously the story was thought out quite thoroughly, the map right before chapter one, showed how every attention was given to detail. And yet, unlike with some fantasy authors, there wasn`t a bombardment of prolific descriptions, but rather any descriptions given had a purpose to further the story and moved the pace along. Division of the Marked, should be amongst any lover of fantasy`s book collection. An effortless 5 out of 5. I have read many fantasy books, but Division of the Marked by March McCarron stands out. I found this one through Book Review Depot group on Facebook (like most of my recent reads) and couldn’t wait to read it. Read on to find out what I thought! Synopsis (from the author): For all of written history, on the day of Da Un Marcu, fifty boys and girls across the three kingdoms are marked. They become a class apart from society. Taken to join their brothers and sisters, the Chisanta, they enter a cul I have read many fantasy books, but Division of the Marked by March McCarron stands out. I found this one through Book Review Depot group on Facebook (like most of my recent reads) and couldn’t wait to read it. Read on to find out what I thought! Synopsis (from the author): For all of written history, on the day of Da Un Marcu, fifty boys and girls across the three kingdoms are marked. They become a class apart from society. Taken to join their brothers and sisters, the Chisanta, they enter a culture of knowledge-keepers, martial artists, and possessors of strange and wonderful abilities. When Yarrow discovers himself marked, he is lost and lonely; until he meets Bray, a spirited and curious girl with whom he feels uncommonly connected. As the two of them become familiar with their new lives, unaccountable events unsettle the peace. A mysterious murder leaves the Chisanta in confusion. Odder still, one of the fifty children never arrives. In the years that follow, more and more children of the Chisanta go missing. What I liked: March McCarron grabbed my attention right from the start with the introduction of Yarrow as one of the marked. Bray soon joined Yarrow and they began their lives as members of Chisanta. The twists and turns of Bray and Yarrow’s paths – and those of their new found friends among the Chisanta. I enjoyed the divergence of their paths, the distrust between the two factions of the Chisanta – Bray is Chiona and Yarrow is Cosanta – and how their paths once again converged. Great plot, great pace, and memorable characters makes this one of my recent favorites! What I didn’t like: For me, there wasn’t much to dislike about the book. About the only criticism I would have is the conflict between Yarrow and Bray when they reunited was predictable and its resolution just as predictable. It didn’t detract from the story, though. 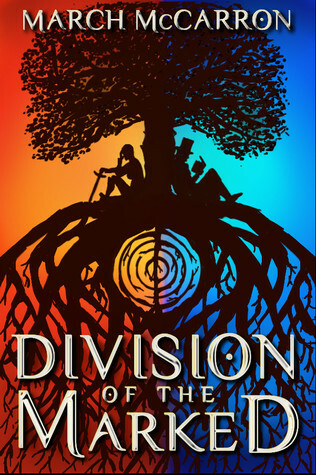 Overall impression: Division of the Marked was a compelling, interesting read for me. I would highly recommend it to any readers of fantasy or simply anyone who enjoys an excellent novel I can’t wait to read the next book! Division of the Marked by March McCarron starts out with Yarrow, who has just been marked as one of the Chisanta, a special group in their society, who are privy to information and secrets and have special abilities. The children chosen are random and often have faults, often physical. Unlike many stories where magic is dependent on race, refreshingly, this story didn’t go that way. Once Yarrow become part of the Chisanta, he meets the copper haired Bray, who is also marked as one of the Chisant Division of the Marked by March McCarron starts out with Yarrow, who has just been marked as one of the Chisanta, a special group in their society, who are privy to information and secrets and have special abilities. The children chosen are random and often have faults, often physical. Unlike many stories where magic is dependent on race, refreshingly, this story didn’t go that way. Once Yarrow become part of the Chisanta, he meets the copper haired Bray, who is also marked as one of the Chisanta. Yarrow is immediately smitten with her. The story moves along, introducing us to the world they live in as they journey to the temple and once they are at the temple. This is one of those fantasy novels where you are not sure of the time period, it feels almost medieval, but then like feudal Asia. There is the expected conflict between the various characters and the character development that goes with that, done in a realistic manner. The settings are real and you are drawn into the world. I was reminded of the monks in China at first, but the discipline and structure of the Chisanta wasn’t the same in any way. Eventually a mystery is uncovered, and Yarrow and Bray must come together and discover what is happening to some of the Chisanta and why some of them never arrived at their destination. “Aren’t you going to tell me how nice I look?” she asked. “Putting a beautiful thing in a fancy wrapper cannot inherently improve it,” he said. While at other times I had a hard time with the stiffness and formality of the narrative, and some odd capital letter usage was a distraction. All in all, I enjoyed the book, the romance between Yarrow and Bray, and the interaction of the characters and the mystery, made it a lively and enjoyable read. I am looking forward to future books. This book is a fantasy set in a world in which people are "marked" by spirits/Gods/some other power and set aside as protectors. They possess special abilities, martial arts skills, and power. We are introduced to these special people (called the Christana) through the eyes of several newly marked. We follow them through their lives until they must team together to find out why their numbers are slowly dwindling each year. This book is a new favorite for me. It really had everything I like. It ha This book is a fantasy set in a world in which people are "marked" by spirits/Gods/some other power and set aside as protectors. They possess special abilities, martial arts skills, and power. We are introduced to these special people (called the Christana) through the eyes of several newly marked. We follow them through their lives until they must team together to find out why their numbers are slowly dwindling each year. This book is a new favorite for me. It really had everything I like. It has a great world, strong characters, romance, coming of age, mystery, magic, and more. I really loved the characters, especially Yarrow and Bray...they are very multi-faceted and deep. I enjoyed seeing the differences in the two factions of Christana and how they interacted with each other and with the non-marked. I loved the imagination here, of the world, and of all the special abilities the characters had. All-in-all I loved this book. I don't have anything bad to say except I found one word in the entire novel that I felt was a bit too modern/slang to be used in a fantasy world. So that isn't finding much bad to say. I'm really looking forward to reading the next one in the series. Phenomenal book! When I got to the end, it was a great disappointment that the book was over. I wanted to continue on with these characters. I cannot wait to read the next book In the series. Retread a year later! I finally got around to starting the second book and was so lost I had to reread this book. A year is way too long between books! Still waiting for the release of the 3rd book in this series. This first book blew me away. I honestly wasn't expecting much because I'd gotten it as a free download. They're hit or miss. But it is fantastic! I read this book in just a couple of settings. The characters are likable and engaging. Love the tension between Yarrow and Bray! The story is so full of action, adventure, suspense and fantasy. I could not put it down! Definitely worth the read! Can’t wait for the fourth book!! Love the characters and the story line. I looked forward to reading the next book in the series. Three things to mention first: 1. The rating is based on goodreads (3* = liked it), and the rating is for this book only. 2. The review is for the series. 3. Review might contain mild spoilers. So I got the first ebook for free from Amazon, and to my surprise it turned out to be quite good. You could see it had heavily borrowed ideas out of famous fantasy works, but it was written and represented freshly enough that it seemed to have a charm of their own. Characters were showcased well with suffi Three things to mention first: 1. The rating is based on goodreads (3* = liked it), and the rating is for this book only. 2. The review is for the series. 3. Review might contain mild spoilers. So I got the first ebook for free from Amazon, and to my surprise it turned out to be quite good. You could see it had heavily borrowed ideas out of famous fantasy works, but it was written and represented freshly enough that it seemed to have a charm of their own. Characters were showcased well with sufficiently different personalities to one another. The overall premise was looking very promising. First hitch occured when there is the time skip (somewhere before the half way mark). Time skips I believe are very delicate things, especially when the story's main characters are young, and should be used with great care. The bigger the time skip, the more careful you have to be. Reason? The character growth has to be believable and sufficient. Character degradation or stagnation is unacceptable. If you want to do that then don't bother putting in a time skip at all, and alter the rules of your world to suit the story from the point after the time skip. Or make a prologue and condense the pre-time skip part there. The second big thing to remember when you put in the time skip is don't put the elements that attracted and kept the readers hooked to your first part of the story into the time skip. Imagine for example if J.K. Rowling, after the first few chapters in Harry Potter to the point where Harry goes to sleep in his dorm at Hogwarts, had done a seven year time skip and continued the story from there. Would we have enjoyed the series as much? Very likely not. But what we get is very similar. After the particular fictional element that makes the base of this book being hyped to the stratosphere at the beginning, we end up then seeing ridiculously little of it. There are no rules, no borders that the writer has constrained herself by. A dangerous mistake. No rules means no borders for the readers also to find holes in the plot. In spite of these issues, the first book does manage to hold enough interest and remain engaging till the end as the plot is slowly revealed. It is from the second book where the standards are shot dead and fall off a cliff to tangled ruin. Predictable romance is introduced for the main characters. And then the author busies herself to start hooking up her other characters. Massive plot holes occur at every important event. Bed guys start getting hax powers just to make the situation seem impossible. When it does truly become impossible, the good guys are given hax powers to swing the balance. But we can't have the good guys win so easily can we? On no, there is a large part of the 2nd book and all of the 3rd to write. So the good guys are promptly nerfed by any means necessary (which means unrealistic scenarios). Explanations provided is woefully inadequate and highlight the author's inability to think things through. Character re-writes are done time and again so plot stays its course like a drunkard navigating a tropical rainforest. Orson Scott Card once said that books, fiction books, were divided into four different groups: those that focused on character, those that focused on a new world, those that focused on an event, and those that focused on an idea. This was a character book. 1) First of all there is the 'wow, I have suddenly become a whole different person than I thought I was going to be growing up. I am suddenly 'marked', have magical powers, and have to become one of two different groups, very antagonistic, living miles apart. 2) I suddenly have a very deep relationship with several new people, including a sexual interest, and our relationships get torn about by the above mentioned two groups. 3) Someone is killing a bunch of people. Our kind of people. Needs to be stopped. The author handles each of these tensions pretty well. The very annoying ten year gap in the story is a cheat: designed to keep the reader's mind on the 'how we felt about each other when we got broken up', and pass lightly over the (relatively important) new idea that 'we are part of two separate groups the hate each' without having to actually explain why these two groups hate each other… or what most of them do most of the time anyway. But the ten year gap works for that. If the author, or the reader, doesn't want to do the hard work of living through (or writing through or reading through) that ten year gap while the tension rises even while the nostalgic 'remember who we were then' fails to fade… then one needs a ten year gap. But my problem with this book is I happen to like books that actually explain the world, and where the world makes sense. And this book, and this world, do not. Two groups which can fight extremely well due to the above mentioned magical powers: cool. These two groups in a world where no fighting goes on? Weird. I nabbed this book for free during a limited time offer. I'm probably too skeptical about the quality of some of these free offers, but the summary was interesting enough that I gave it a shot. I'm SO GLAD that I did! If I could've known how pleased I'd be with it ahead of time, I would've gladly paid full price. Once I started, I pretty much couldn't put it down. The way the magic works, the characters, the building tension and mystery sucked me in - the mark of a great story. I felt like there was enough that I could start to unravel on my own with some of the foreshadowing and small hints, but there were plenty of surprises left to experience, as well. I was glad for the quality in the writing, too. The style was approachable without being too simple. The author's "voice" resonated with me and had me moving along with the story, completely immersed, without any rough edges to force me out of it. I liked the characters - not necessarily as people but I found them well developed and easy to relate to. They had vivid, lifelike personalities. My only issue with the book is that it was like the plot was an excuse just to add tension to the character's relationship, if that makes any sense. -I'm suddenly magical = separation from family (and eventually friends as even these special magical individuals are divided into two groups, and never shall the two intertwine -of c I liked the characters - not necessarily as people but I found them well developed and easy to relate to. They had vivid, lifelike personalities. My only issue with the book is that it was like the plot was an excuse just to add tension to the character's relationship, if that makes any sense. -I'm suddenly magical = separation from family (and eventually friends as even these special magical individuals are divided into two groups, and never shall the two intertwine -of course the two friends are in seperate groups because tension!) Um, never got a clear sense of why these two groups hate each other. Actually, what do these people even do? Why magical warriors when there's no war? I get why there was a ten year gap, it's a valid authorial choice, I just feel like all that time could have been useful for world building. Division of the Marked is a wonderful tale about how a group of children meet, how they are separated and grow whilst apart and how,even though they are pitted against each other for a decade,they still hang onto the memories of childhood and become even closer;some more than others. March McCarron wrote with such soul that I laughed,I cried,I rejoiced and I grieved alongside her characters.A wonderful book,just what the doctor prescribed. Liked that you could follow the main characters. The fact that there is a break within their relationships is easy to get past. A bit of a new take on powers or gifts that are usable rather than not. A book that could realistically take place anywhere however the author chose to make it up, secretly I am pleased about that. YA fiction. I enjoyed this book!! It is similar to the TV show Heroes, with the abilities in that you can have just about any kind. There is friendship, factions, poor governing, greed, love. I feel like this is deeper than most fantasy YA fiction. It has lots going on that keeps the story moving without constant action. Characters develop, things change. A great storyline full of twists and turns. Friendships stretched to the limits by taught prejudices and the journey of trying to overcome those prejudices in order to survive. Pretty good, but the ending isn’t as much fun as the rest of the book. I found the invincible bad guy with his infinite advantages a bit irritating, too. Felt unfair. Apparently the second book is a lot darker, which was not the aspect of this book I enjoyed. So I’ll probably give it a miss. Maybe 3.5 for being very well written. The premise was interesting, the characters were fairly likeable, but something was just missing. It was interesting but not exciting. “What shall we do now?" he asked.